Can the world continue expanding its use of renewable resources at an increasing rate? Most likely not. Using a data set of over 25 resources researchers at the Helmholtz Centre for Environmental Research (UFZ), Yale University and Michigan State University demonstrate that several key resources have recently passed, at around the same time, their “peak-rate year” — the maximum increase year. A potential implication is that as substitution becomes arduous, global society’s expanding needs will be harder to fill. They explain this in an article published in the latest issue of the international journal Ecology and Society, and featured in the journal Nature’s Research Highlights this week. Landscape ecologists Prof. Dr. Ralf Seppelt, Dr. Ameur M. Manceur and plant ecologist Dr. Stefan Klotz from the UFZ analysed the production and extraction rates of 27 global renewable and non-renewable resources together with economist Dr. Eli Fenichel from Yale University and sustainability scholar Dr. Jianguo Liu from Michigan State University. They examined 20 renewable resources, such as maize, rice, wheat or soya, which represent around 45% of the global calorie intake according to the Food and Agriculture Organisation of the United Nations (FAO of the UN), as well as animal products, such as fish, meat, milk and egg. For 18 of these renewable resources the annual growth rate (for example the increase in meat production or in fish catch) reached its peak — the peak-rate year — around 2006 a few years ago. The term peak in the context of resource use is not new as it was popularized in the discussion about peak oil initiated in the mid-1970s. The peak oil analysis of the mid 1970s alleged that the crude oil extraction rate would significantly decline after a given year. Whether such a decline will happen and what would be the ultimate cause has been hotly debated among scientists. Though oil production has actually continued to expand, other resources have followed such a pattern. UFZ researchers used a dataset of more than 25 resources and made limited assumptions, relying on computer power to extract pattern from the database. “For many resources, but not oil, we indeed observed a peak pattern”, states Dr. Seppelt. Surprisingly, they discovered not only that 20 resources had a peak-year but also that for 16 of the 20 resources with a peak-year, the peak-year lay between 1988 and 2008 — a very narrow range in the history of humanity! “The key commodities that a person needs for food and must harvest are limited”, summarizes Dr. Seppelt, Head of the Landscape Ecology Department at the UFZ. Renewable resources become scarcer. 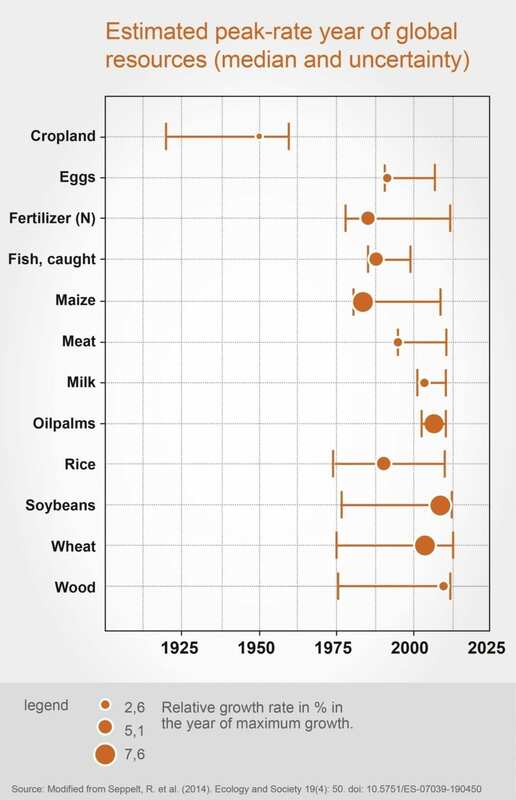 The authors were able to illustrate this using a various examples: The maximum global growth rate in crop yields for soya beans was in 2009, for milk it was 2004, for eggs it was 1993 and for the fish caught it was 1988. Data from other studies confirm these results. For example, the crop yield per area with maize, wheat, soya and rice on more than a quarter of the farming area around the world is stagnating or decreasing according to the US scientists. October 31, 2018 - Why in the universe is a blockchain company buying the assets of a formerly high-flying asteroid miner? GeekWireAfter months of uncertainty, the Planetary Resources asteroid-mining venture says its assets have been purchased by the ConsenSys blockchain venture. June 25, 2018 - Amid departures, Planetary Resources is holding out hope for an asteroid mining comeback GeekWirePlanetary Resources' quest for cash continues even as space industry leaders converge on the Seattle area for this week's NewSpace 2018 conference. June 22, 2017 - 6 Benefits of Renewable Energy We Need to Consider The Alternative DailyRenewable energy seems unattainable sometimes and like magic other times, but the reality is quite different. From solar and wind power to geothermal, biom. December 18, 2018 - Growth fears drive FTSE 100 to two-year closing low - as it happened The GuardianRolling coverage of the latest economic and financial news, as stocks suffer their worst December in decades. November 17, 2016 - What is the difference between renewable and non-renewable energy sources? eNotesRenewable energy is derived from power sources that don't run out, such as wind, water, and solar power. Non-renewable energy, on the other hand, is finite.